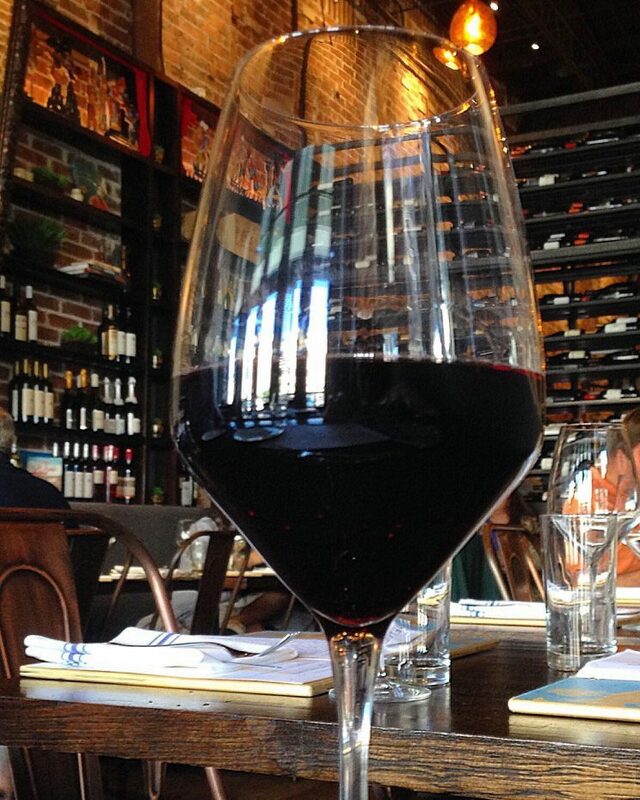 When dining out, the wine list at a restaurant is equally as important as the food for wine enthusiasts. Really it is. More than anything, I’m always on the lookout for something new and unfamiliar or at least something different than what everyone else is doing. Of course, it starts with the food, but add in a wine program that has a commitment to offering quality, non-mass produced wines at fair prices and you’ve got a gem. 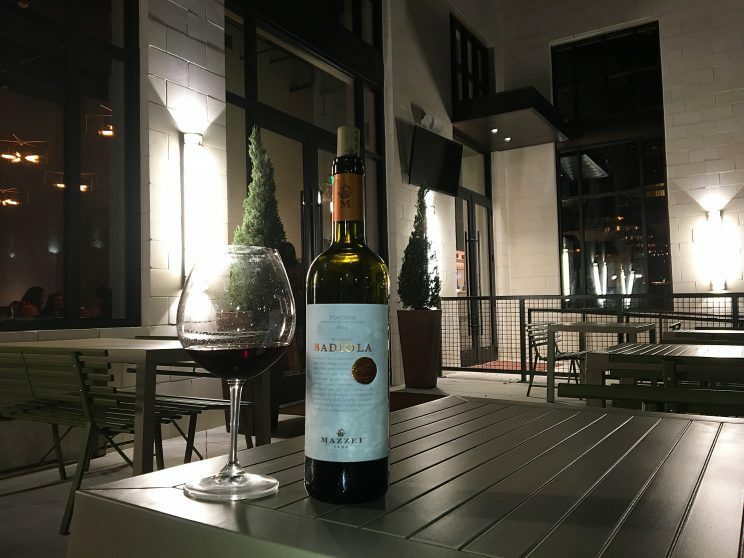 Lucky for Houstonians, there is an amazing variety of restaurants with creative, thoughtful wine lists. All of these restaurants get it right when it comes to wine. 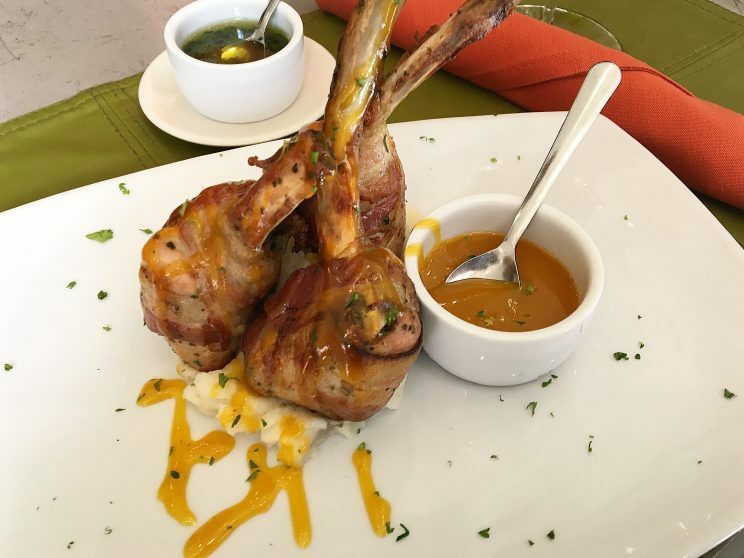 Anyone that is familiar with the Houston dining scene knows the H Town Restaurant Group which includes favorites such as Hugo’s, Backstreet Café, and Caracol. The group’s foray into the cuisine of Oaxaca, Mexico is its latest endeavor and it does not disappoint. Sitting and discussing the restaurant’s food and drink with Wine & Beverage Director Sean Beck was like being taken on a journey to Oaxaca and experiencing the customs and traditions through the eyes of a local. Whether it’s the house-made masas, the extensive mole selection, the fresh seafood, or the edible insects (I had ants in my mole and it was fantastic! Who knew?!) the cuisine really is celebration for your taste buds. And as expected, the wine list with its focus on sustainable, organic, and biodynamic wines is a thing of beauty. The wine list itself is a thoughtful read, including some history on Mexico’s wine industry. 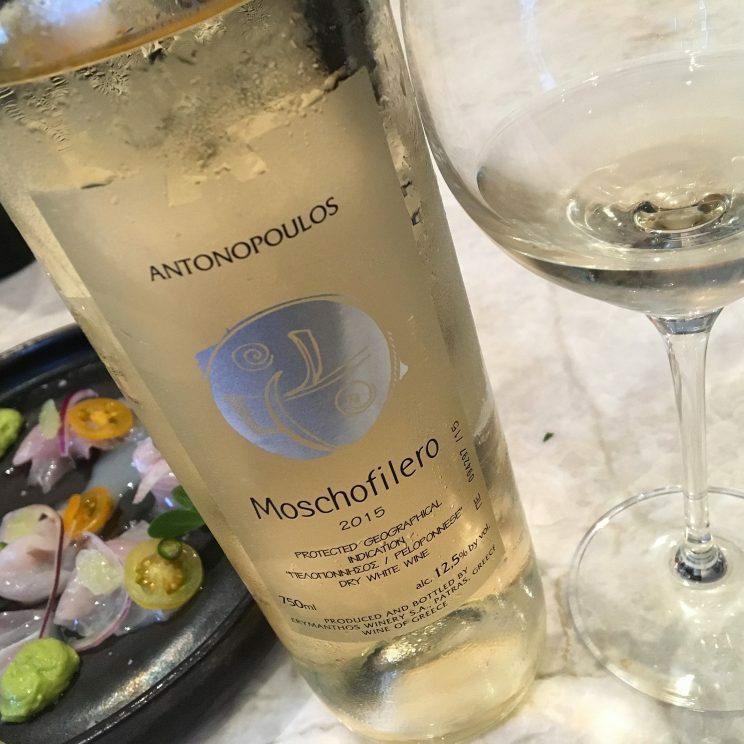 In addition to about twenty wines from Mexico, diners can enjoy wines from around the globe including this fantastic Moschfilero from Greece. It was fantastic with the Robalo – a delicious creation of sea bass, rambutan, avocado, purslane, and lime. 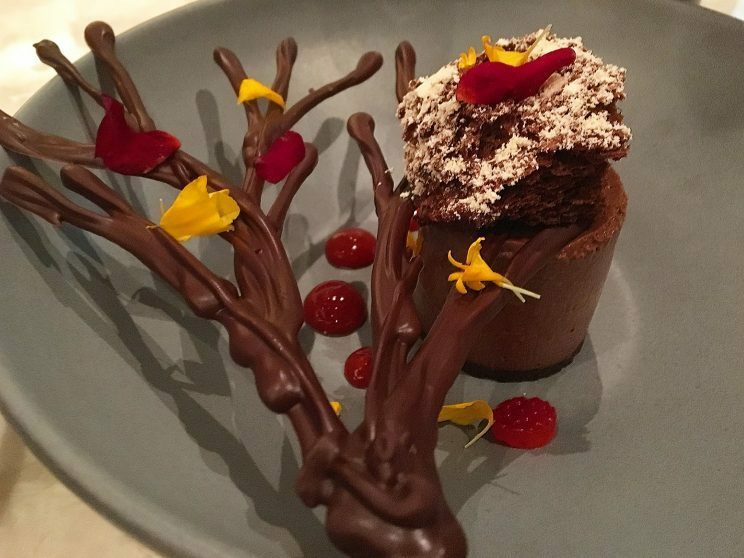 OK, and do yourself a favor and have one of the restaurant’s amazing chocolate desserts (there’s a separate chocolate menu!) with one of their dessert wines. I highly recommend a glass of Pedro Ximenez (PX) Sherry. 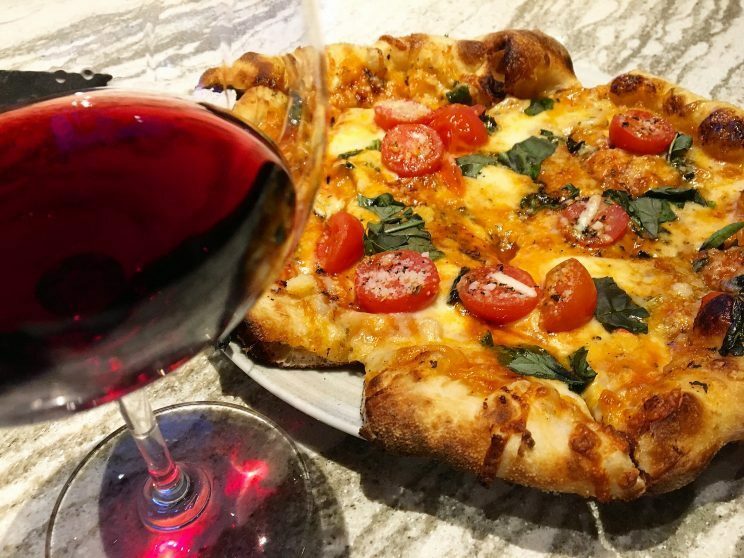 A new addition to the River Oaks / Highland Village area, this upscale causal spot from the Adair Family Restaurant Group has a wine list that is as approachable as it’s food menu. Comfort can be found in both. Beverage Director Danny Frounfelkner says that while this is one of the smallest lists he’s ever put together, there’s no shortage of creativity and thoughtfulness in assembling the list. Danny’s goal was to stay away from “retail wines.” You know the stuff that you can get just about anywhere? Instead, the focus is on small, boutique, family-owned wines but with an eye to approachability and affordability. Like Napa Cab or Carneros Chardonnay? Great. Danny has it but it may not be a producer that you recognize. Diners get the comfort of having a grape they recognize but from a quality producer with which they may not be familiar. 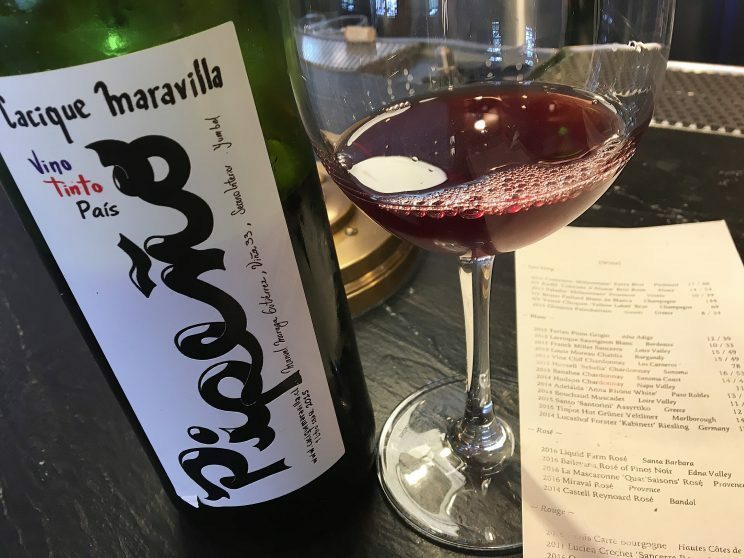 But what’s even better are the unexpected selections like this 2015 Cacique Maravilla Pipeno Pais from Chile. New grape for me and I still cannot believe this wine is unfiltered. So whether you’re there for the Raw Bar, the Sweet Tea Brined Pork Chop (yes! 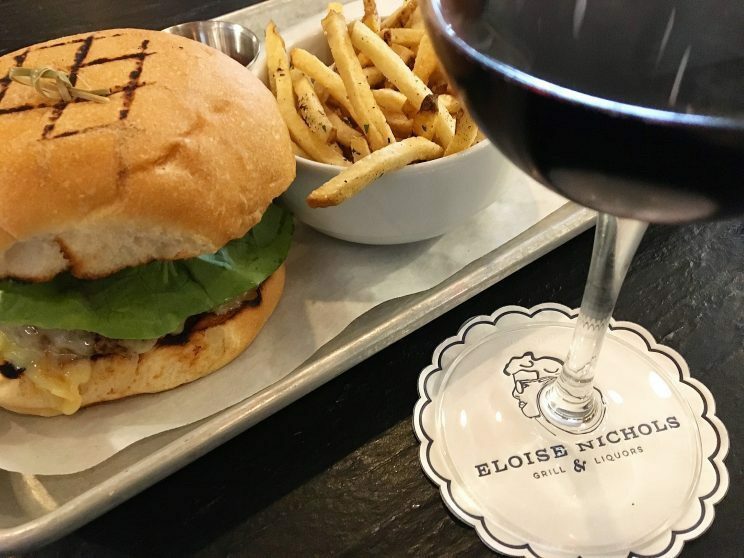 ), or the Texas Beef Burger (that bun and those fries tho’), there is no shortage of good eats to accompany your vino. So while the seafood and Raw Bar truly rock here, the land creatures certainly hold their own. Between the Twice Fried Hot Chicken (please offer a bucket – #DontJudgeMe) and the Duck Carnitas, I couldn’t stop licking my fingers. But as a good “wine professional” I kept my glass fingerprint free. I think. And these Texas Blue Crab Fingers are still occupying thoughts in my head. Wine is an essential part of the identity of State of Grace. And while you can certainly find vintage wines, cult wines and impressive verticals, there is something for every wine drinker. 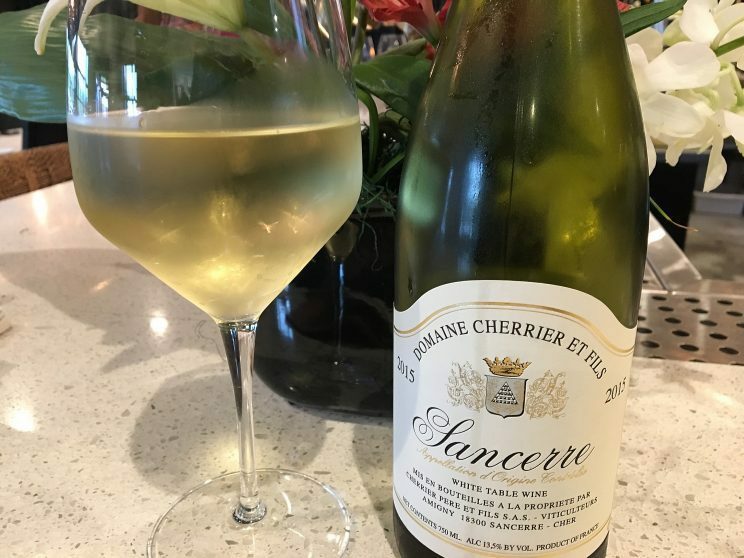 Beverage Director Lara Creasy is as committed to offering rare and allocated wines as she is to offering a wine list that is accessible to guests at all price points and knowledge levels. With over 250 bottle selections ranging in price from $28 to $1,250 (yes, someone can treat me to a First Growth Bordeaux) as well as an impressive by-the-glass selection (so many drop the ball here) with a median price of $11, you’d be hard pressed not to find something you love. Conceived and brought to life by Astros owner Jim Crane, Osso & Kristalla and sister restaurant Potente sit side by side and are located across from Minute Maid Park, home of baseball’s Houston Astros. The casual menu at Osso & Kristalla offers up delicious Italian cuisine including pastas, sandwiches, salads, and Italian Secondi all with a modern twist. But it’s the wood-fired pizza that keeps me coming back for more. 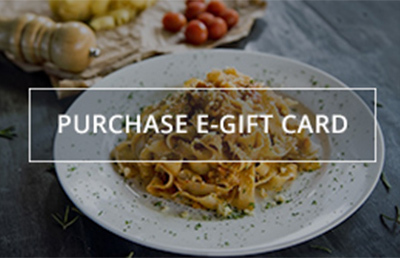 The fresh ingredients and quality toppings are certainly evident, but the perfectly executed crusts – crispy on the outside with a light and fluffy softness on the inside – are the perfect base for the authentic Italian style pizzas. The Margherita pizza is the real deal. As the cuisine is Italian, about 65% of the list is made up of Italian wines. But what’s nice about the list is that the bulk of the bottle selections (with just a handful of exceptions) come in at $50 or less. $50 Barolo? Yes indeed! 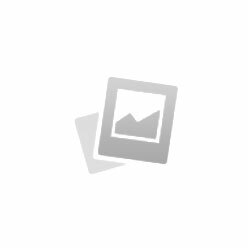 Certainly gives you an opportunity to try something new without breaking the bank. The goal according to Wine Director Vinny Montecuollo? To have the customer not be afraid to truly explore the wine list. And – to make them come back and try more. I have long loved all of the Clark Cooper Concepts restaurants for the delicious food (I have a love affair with Ibiza) as well as some of the most favorable wine markups (barely above retail) I have ever seen. SaltAir Seafood Kitchen is no exception to the delicious cuisine and extensive, fairly-priced wine selection characteristic of the restaurant group. In fact, the Clark Cooper Concepts’ philosophy when building its wine lists is placing a bottle of wine on every table. Goal attained. Seafood reigns supreme at SaltAir and the wine list is a testament to wines that pair perfectly with such foods. Whether it’s bubbly, clean, crisp whites, or light-bodied reds, there is no shortage of wines to pair with the extensive selection of fresh fish, shellfish, or items from the Raw Bar. Yes there are some land lubbers on the menu but it’d be almost criminal not to indulge in the seafood! 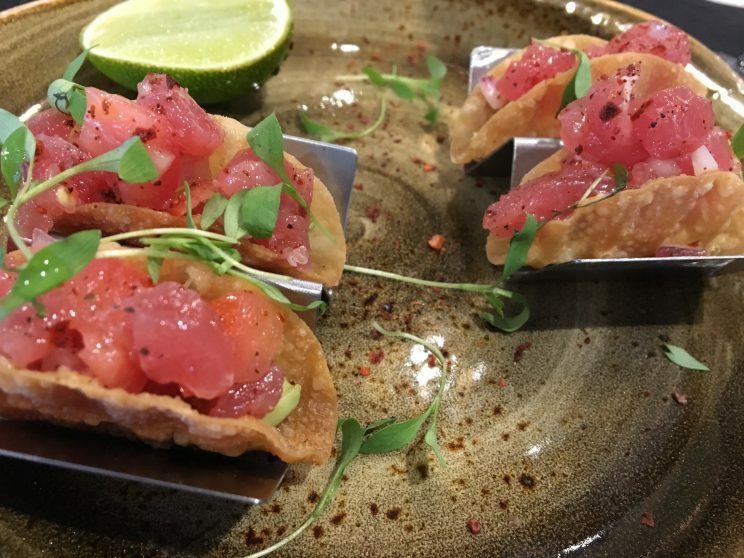 And do yourself a favor and get an early start on dinner by catching happy hour and indulging in these delicious mini tuna tacos. Anyone in Houston with a pulse that eats out knows the story of Chris Shepherd and his desire to share the story of Houston food through his restaurant Underbelly. 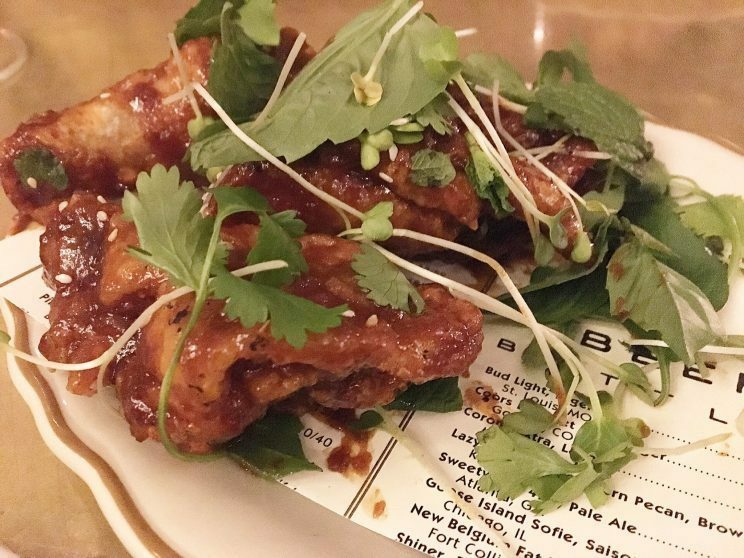 Even folks outside of Houston know about the innovative cuisine, the commitment to buy directly from farmers, the focus on seasonality, and the desire to celebrate the cultural diversity of Houston. And while I do love the food (I feel the need to visit a lot as the menu keeps changing! ), it’s the wine program that is near and dear to my heart. Underbelly’s motto? “The wineries must be family-owned and operated. Period.” Great motto and what a list it is. Not only does it read like a comic book of sorts with caricatures and funny quotes throughout including some from UGK rapper Bun B (wine is fun and we don’t need to take ourselves so seriously), it is also a treasure trove of the unique and the unexplored at blessedly low markups. Lists such as these with a great variety and prices that don’t beat you over the head invite you to really explore and try new wines. 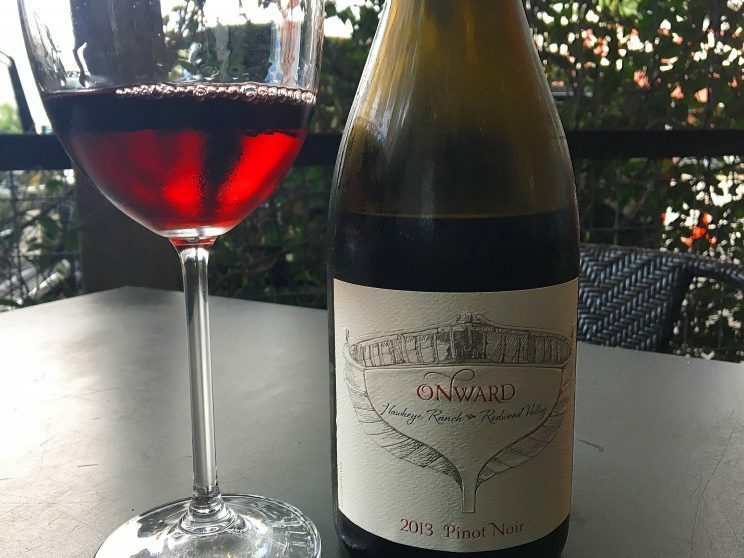 As a self -professed lover of Pinot, I absolutely swooned over this Onward Pinot Noir. Light and elegant, with tart cherry and earthiness I can’t say enough about how happy I am that our waiter suggested it. It was truly a beautiful wine with some distinct Burgundian characteristics. And versatile. 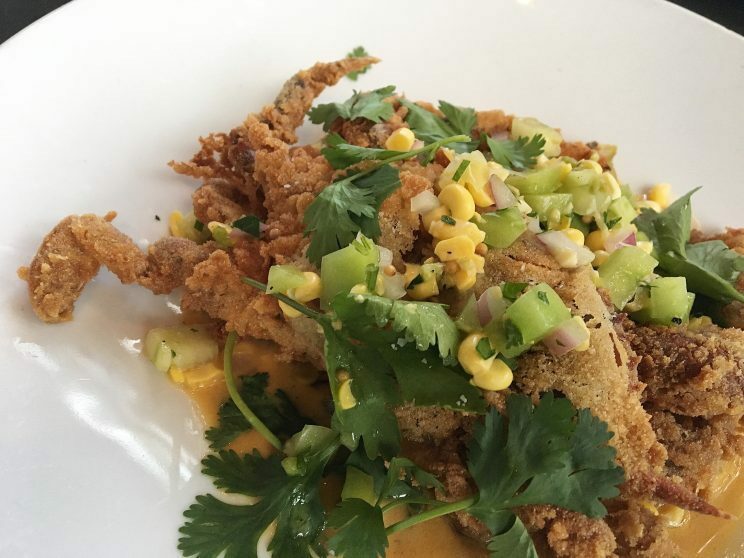 We had a variety of small plates, including this delicious fried soft-shell crab (one of my favorite seasons!) with corn maque choux and green tomato relish and it never skipped a beat. I also had the opportunity to try the Onward Skin-Fermented Malvasia Bianca which was floral beauty in a glass. I didn’t even know Malvasia was grown in the U.S.! Can’t wait to go back to see what else I can discover. If you can’t get to Greece for the wine, not to worry as there is no shortage in Houston. Touting a 100% Greek wine list, both the original Helen Greek Food and Wine and its newer, causal sister restaurant Helen in the Heights simply amaze at the extensive selection of wines. And no worries about not recognizing (or even pronouncing) the wines as the wait staff are well equipped to help you with that. A big fan of Pinot or Bubbly? They can steer you in the right direction. While both locations give a nod to authentic Greek cuisine, the new Heights location is the more casual of the two spots and sports a larger food menu with more small plates. Additionally, all of the wines are available by the glass and none clock in over $70. The original location has the larger wine list, and has an impressive by the glass list as well as an extensive bottle selection. You can’t go wrong at either location. 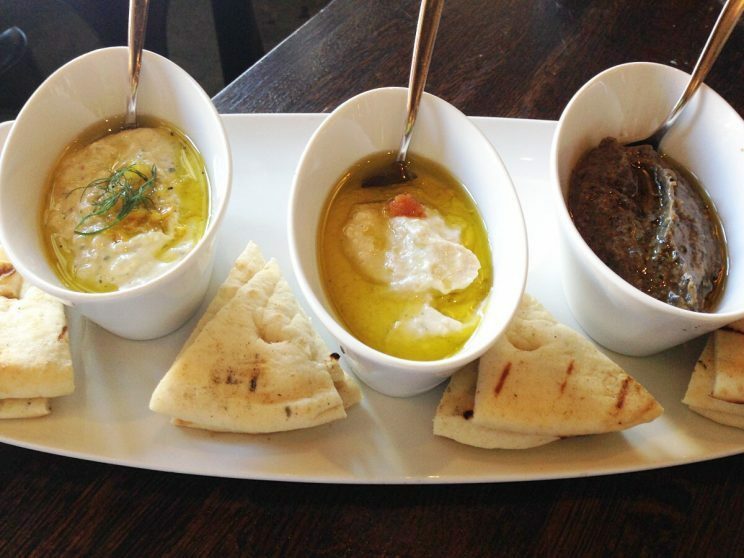 And while the menus are different at the two restaurants, they both offer the trio of Greek dips which shouldn’t be missed. With a detailed focus on every aspect of the restaurant (the lighted columns on the wall represent the twelve tribes of Israel while the wavy texture on the wall is symbolic of sand), Peli Peli wows diners with its authentic South African cuisine. And while the décor is certainly over the top, there’s more to the restaurant than just a beautiful façade. South Africa’s cuisine is a fusion of different cultures including Dutch, Portuguese, and Asian and diners are certainly taken on a culinary journey. If you aren’t familiar with the cuisines, you’ll have a hard time deciding what to order as its all sounds so delicious. But the well trained staff are full of info and can help guide you if you’re torn. 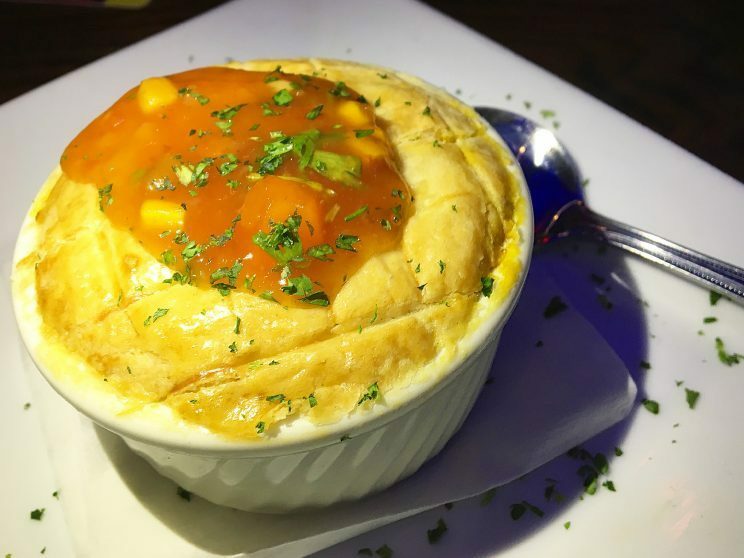 But whatever you get, be sure to start with the Bobotie, which is almost like a pot pie of sorts with curried ground beef, carrot bredie, and flaky pastry crust finished off with a mango chutney sauce. The flavors were amazing. In addition to its cuisine, Peli Peli takes its wine pretty seriously as well. 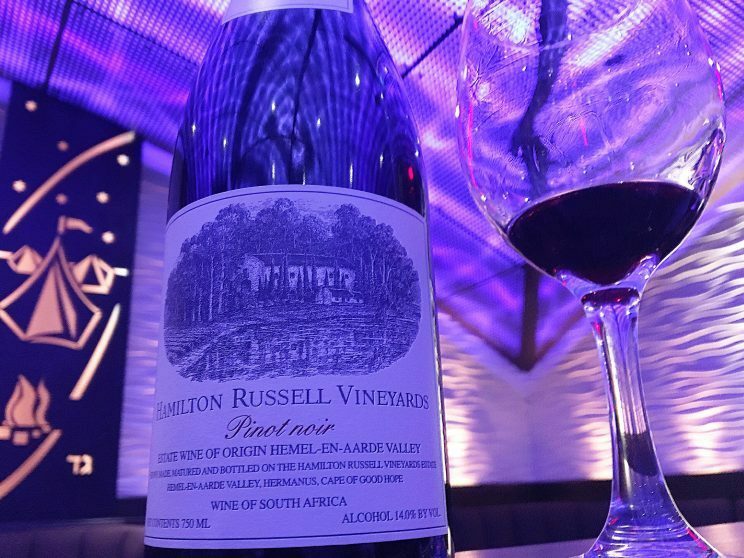 While the restaurant currently has a significant amount of wines from South Africa, it is in the process of transitioning its list to around 90% South African wines to truly showcase the region’s wines. As an added bonus, the restaurant also plans to lower the markups on its wines which really gives diners even more opportunities to discover the wines. They also have their own private label wine collection from the Western Cape’s Stellekaya Vineyard which features a Cabernet Sauvignon, a Bordeaux style blend, Chardonnay, and Pinotage (I keep trying to love Pinotage). But I did love this Hamilton Russell Pinot Noir which I’d been eyeing for several months. 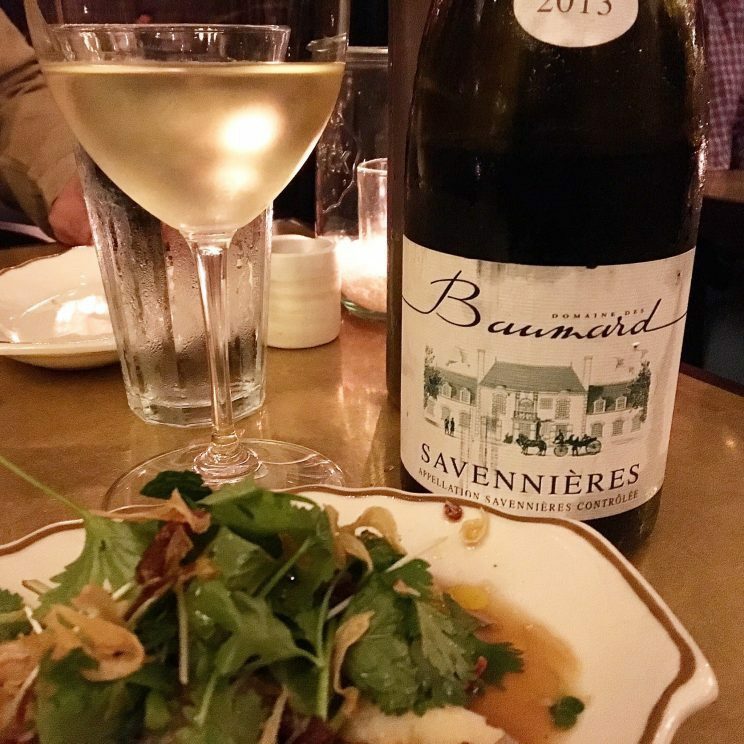 Yes loop dwellers, you can go outside the loop for great cuisine and innovative wine. City Centre’s Sal Y Pimienta brings the goodness of South America to Houston’s doorstep. You’d be hard pressed to find a better selection of Argentine Malbec, Chilean Carmenere and Cabernet Sauvignon, or Uruguayan Tannat in the state. There is also a selection of other international wines but that’s not what you’re there for. 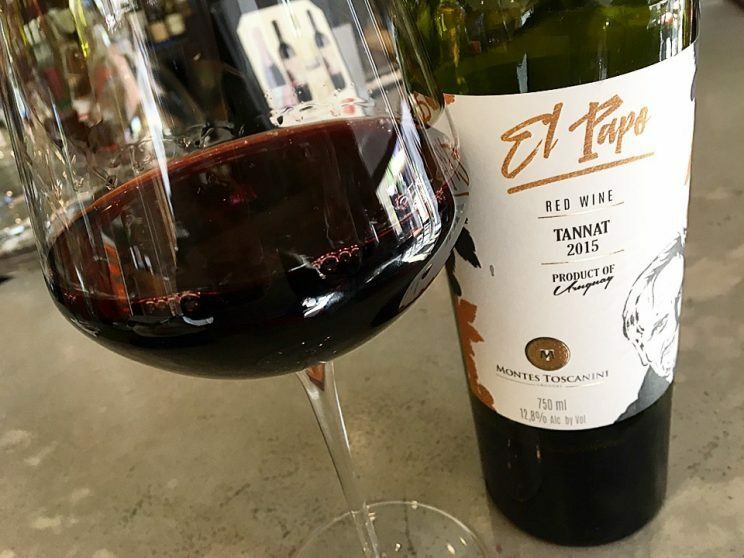 Whether you try the Tannat Rose (my first) or this Montes Toscanini “El Papo” Tannat, you’ll find no shortage of wines to discover. In fact, the El Papo was quite a surprise. Tannat is typically full-bodied and quite tannic but this one was almost as light-bodied as a Pinot Noir. Who knew?! Just tell the well-informed staff what style of wine you’re after and they will certainly find something to please your palate. And do your palate a favor and try the Prim Pork Lolichop which is bacon wrapped and served with a spicy mango sauce. Fantastic with the El Papo Tannat!